This was another week that was so crazy busy it flew by in the blink of an eye. Everything is moving forward and in the process of getting done, and all of us are working like lunatics at warp speed. Here are some of the details. The week ended and started with storms and intermittent loss of electrical power and lights. We lost the Internet connection at the office over the weekend and it remained out until Wednesday afternoon. We've been playing catch up ever since. We thought we had escaped long-term power loss until we were plunged into darkness, again, on Tuesday about 6:00 PM. Chuck Walton, Ben Rodriguez and most of the staff were chatting, laughing and signing 500+ books for the Northern Gun™ One crowdfunding packages as well as books and prints for Christmas Surprise Packages when the lights flickered and 15 seconds later, went dark completely. It’s dark at 5:30 PM these days, so when the lights went out it turned the warehouse into a black abyss. It was like being in a big cave. Fortunately, cell phones and nearby flashlights enabled us to collect up our gear and head out. Perhaps needless to say, the on and off lights created a certain amount of chaos and put us behind where we wanted to be. Still, we got Fear the Reaper™ to the printer before the storm knocked out our power and Internet, and we managed to get The Rifter® #64 to the printer anyway – mainly thanks to getting power intermittently and working through the weekend. Wayne sent the final digital files to the printer via his cell phone. The traffic light near the office was out for days, which made even coming and going to the office a challenge, as cars would line up for a block or two as travelers negotiated the four-way stop. I actually started to go around and come in a different way, because going a half mile around was faster than the 20-40 minute wait at the stop-sign intersection. It all made for a pretty wild and intense week. Despite losing the Internet for almost a week and on-and-off electrical power, we fared much better than many people in Michigan and Illinois. We were spared tornadoes and we had power most of the time when 300,000+ other people did not. Wayne and his family lost one of their favorite trees which got uprooted, but they lucked out, too. Though the tree fell on the house, it was very close to begin with, so it slowly leaned against the house but did not actually ‘fall’ on it hard, and it did no serious damage to their home. Kathy Simmons and I lost several small, and a few large, branches from several trees, but also escaped serious damage – just one seven inch long tear through the tin roof off the patio, easily repaired by a friend. By Wednesday, after four days without it, I was having Internet withdrawal big time, and saying how badly I needed my Internet connection when it finally popped back on. Funny timing. The rest of the week has been playing catch up with emails and online business. Of course, there were plenty of things to do without the Internet, which made for another week of long hours. Funny how we take for granted electricity and now the Internet. I would hate to live without them. 2014 Gen Con® Indy – We need Game Masters to run Palladium games – and we need you to send in your game submissions to Gen Con by January 15, 2014!! Yes, I’m talking Gen Con 2014. We want to make a HUGE Palladium push at Gen Con in 2014, and we sincerely need your help to make it happen. Game Masters, PLEASE submit your Palladium games for Gen Con 2014 by their January 15, 2014 deadline! If Game Masters act fast to submit their games in time for this FIRST deadline, they are guaranteed to be listed in the Gen Con program book. Palladium is planning to make the 2014 Gen Con® Indy its biggest and best in decades. Our booth will be twice the size it was this year, and we’ll have the Robotech® RPG Tactics™ game and expansion packs, as well as many new RPG products. If we can get enough gaming events in place by January 15, 2014, Palladium can get a dedicated gaming area for ALL of our events – or even a specified game room. That will mean a place where Palladium G.M.s and fans can game around the clock, 24/7. With this being the 30th Anniversary of Heroes Unlimited™ and a big release year for Robotech® RPG Tactics™, we want to shout to the world that Palladium Books is back with a vengeance. Please help. Thank you. 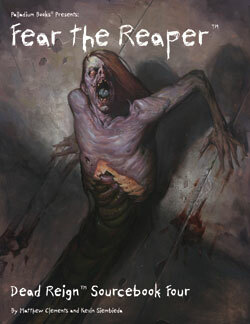 I approved the digital proofs of Dead Reign™ Sourcebook 4: Fear the Reaper™ on Tuesday and the book looks great. We are told it should arrive at the Palladium warehouse November 26. We’ll ship it out to those of you who pre-ordered, that same day! Fear the Reaper™ is an excellent resource and one heck of a read. The kind of book that makes you want to jump up and role-play a Dead Reign™ adventure. Not only that, Alex and others who have read the book have said it’s actually quite uplifting. Something you might not expect from a game based on the Zombie Apocalypse. If you haven’t tried the Dead Reign™ RPG, you really should. I don’t think you will be disappointed. (Btw, the Christmas Surprise Package might be a good way to get a copy.) The Dead Reign™ RPG setting is the Zombie Apocalypse. And it’s not just about gunning down the walking dead, its about survival and keeping some shred of your own humanity. This game is a ton of fun, and one of my personal favorites to run (with Palladium Fantasy® being my number one favorite RPG of all time). Action, horror, adventure, and camaraderie amongst the players are always phenomenal, at least in my experience. I run Dead Reign™ at conventions and gaming events all the time. 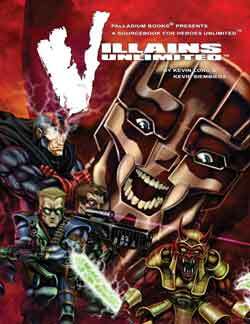 And if you love zombie-based TV shows, movies, comic books and novels, you will adore this RPG. I highly recommend giving it a try. 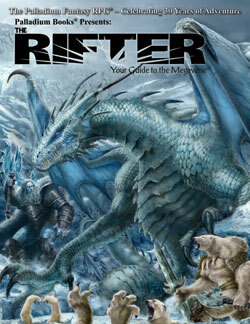 The Rifter® #64 is at the printer and I have already approved the digital proof. It should ship either just before or just after Thanksgiving (November 26 or December 3). The storm, power outage and lack of Internet put us behind, but we did take care of most of the prep work. All books that need to be signed are signed, boxes and mailing tubes built and ready to go, and prints signed. 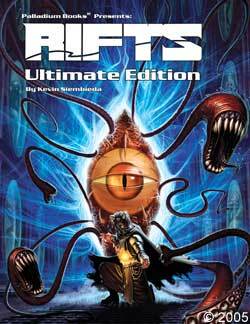 That means the hardcover editions of Rifts® Northern Gun™ will be shipping out to Megaverse Insiders next week, before Thanksgiving. After that, a dozen or two of the Color Hardcover Edition and a few of the Steel Foil Edition will be made available to the lucky Surprise Package recipients who convince Santa Kevin they were good little boys and girls and truly deserve one. A few of each will also be made available for sale on my (Kevin Siembieda) eBay store by the end of next week. 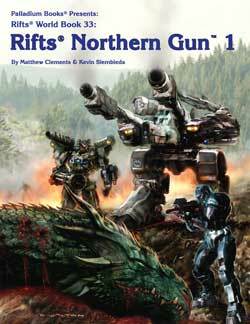 The Rifts® Northern Gun PDF for Megaverse Insiders is prepared and will probably start getting emailed by the end of next week or the following week. We want it to arrive around the same time other crowdfunders are getting the hardcover editions. 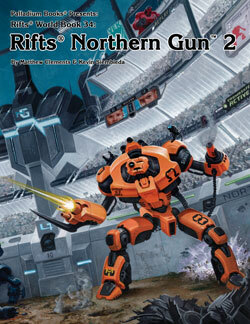 Meanwhile, the Rifts® Northern Gun™ One softcover edition continues to sell like crazy and get positive feedback. Over the next week or two, Alex will be adding a number of collectible Palladium Books related items in my online store, including out of print titles, proofreader copies of books (Northern Gun One, Fear the Reaper, and others), manuscripts with editors’ corrections, some original art, hardcover books, and other items will be included. He’s already added several dozen action figures (all from my personal collection) and he will be adding Palladium items over the next week. All items in the store are from my own personal archives and collection. Take a look, there may be some items that are perfect as holiday gifts. Will there be a Fear the Reaper™ or The Rifter® #64 get a preview? We’ll see. Right now, we have our hands full and Thanksgiving is coming up fast. The number of Surprise Package orders continues to increase as the holidays approach. Cool. Keep ‘em coming. And remember, Surprise Packages are suitable for any holiday, not just Christmas, or for trying new game settings or filling holes in your own collection. I've been feeling a little down and worn out lately, but putting together Surprise Packages continues to put a smile on my face every morning. What is the Christmas Surprise Package offer? It’s a way to get a boat load of Palladium RPG product on the cheap ($80-$95 worth for $40 plus shipping and handling), get autographs and Erick Wujcik Keepsakes, too. And if you’re into it, you can request a number of limited edition prints and even original artwork (limited as all art is donated by the artists). The perfect holiday gift for the gamer in your life. Or maybe for yourself. The Surprise Package is a great way to try new RPGs and plug holes in your collection. Have you tried Dead Reign™? Splicers®? Nightbane®? Rifts®? Robotech®? Here’s your chance. Why does Palladium do it? Because we love you. Really. We do it to brighten the holidays for YOU – the greatest fans in the world. It’s our way to say, you are appreciated and thank you for everything. See the full Surprise Package section in this Update or the full description in the Palladium Online store. It is so worthwhile. And fun. I always try to make everything fun and special, especially something like this which is a holiday gift (even if it’s for yourself). And don’t forget, you can get a bonus Erick Wujcik Keepsake item upon request. See the full description of the Surprise Package below. There’s probably more going on, but this is all my addled mind can whip up today. Feeling a bit worn out. More next week. 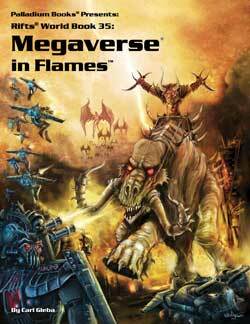 I’ll also try to start posting more Murmurs from the Megaverse and on Facebook. I still need to respond to several dozen private messages, too. Keep the faith and keep those imaginations burning bright. ● $85-$95 worth of product for only about $48 or so in every Palladium Christmas Surprise Package! These days, that’s the price of a core rule book or two supplements. And sometimes the crazy Publisher includes even more value than that! ● Autographs in every book in your Surprise Package, upon request if you want them. For many gamers, this is the only way for them to get signed books. 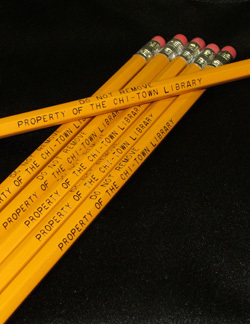 ● Get other goodies like limited edition prints, posters, back issues of The Rifter®, game settings you’ve been meaning to try, T-shirts, coffee mugs, bookmarks, magnets, Chi-Town Library pencils, Palladium greeting cards, and other Palladium goodies. ● A great gift for ALL gift-giving occasions – Hanukkah, Kwanzaa, birthdays, anniversaries, and so on. ● FREE Erick Wujcik Keepsake for Christmas Surprise Packages. A paperback novel or a magazine read and owned by Erick. This is a bonus item. Include it in your Wish List or in the Comments section by saying, “Please include an Erick Wujcik Keepsake,” and we’ll do so; while supplies last. Remember to allow for shipping. Christmas may be 33 days away, but your method of shipping will affect whether you get it in time for that specific holiday. Here is our initial breakdown. Data may change as new info comes in from the various shipping services. UPS Ground in the USA – Place order by December 15! UPS 3-Day Select in USA – Place your order by December 18. UPS Next Day Air in USA – Place your order by December 20. Media Mail – Order must be placed by December 1, 2013 to guarantee delivery in time for Christmas. Parcel Post in USA – Place your order by December 11. Priority Mail in USA – Place your order by December 18. Express Mail in USA – Place your order by December 20. To our friends in Canada and overseas – you need to place your order by December 8 (December 1 for Africa and Central & South America) to guarantee delivery (barring delays at customs). Happy Holidays, one and all! WARNING: Media Mail. Yes, Media Mail is the least expensive way to ship, but during the holiday season we found Media Mail to take anywhere from 5-30 days to arrive. We CANNOT guarantee any package sent via Media Mail after December 1 to arrive before Christmas. We strongly recommend you place your orders early and use Media Mail (the least expensive method of shipping) during the month of November, and UPS Ground (the most reliable method of shipping and tracking) any time up to December 15. Happy Holidays! We have a great many of these items, thanks to the people handling Erick Wujcik’s estate. Our gift to you. ALL Wujcik Keepsakes are FREE additional items that do NOT count toward the overall value of your Surprise Package. It is a BONUS for those of you who might want them. Only available upon request. Include it in your Wish List or in the Comments section by saying, “Please include an Erick Wujcik Keepsake,” and we’ll do so while supplies last. An Erick Wujcik Keepsake is a paperback novel or a magazine read and owned by Erick. This is from his personal and private collection. EACH will either be inscribed or stamped with the words “From the collection of Erick Wujcik” or come with a super-simple statement of origin, we haven’t decided which yet. They are nothing extraordinary, just a book or magazine with sentimental value because it belonged to Erick Wujcik. Enjoy. Erick Wujcik was the game designing genius behind such RPG titles as the Teenage Mutant Ninja Turtles® RPG, Ninjas and Superspies™, Mystic China™, After the Bomb®, Rifts® China One and Two, Rifts®, Dragons and Gods™, the original Beyond the Supernatural™ RPG, as well as his own Amber Diceless RPG, Ambercon and other achievements. G.S. in Salt Lake City, Utah, writes: I love Palladium! I cannot count the hours of adventure, epic-ness, hilarity, sadness (at the loss of a character or major NPC), and comradery you have given me and my friends over the years. I am NEVER disappointed with any Palladium product I am privileged to acquire. I wish the best for the future of Palladium, Kevin and all who are part of the magic that happens in those hallowed walls. Cheers and Happy Holidays! J.D. in Las Vegas, Nevada, writes: Glad you continue to strive toward your goals. You are all very dedicated on turning out a fantastic product time after time. So often we, your fans, do not express how much we appreciate what you have done, and the time and effort each of you dedicate to this project. Please keep doing what you love for many years to come. S.S. in Gainesville, Texas, writes: I’ve been a customer for life, but only last year did I get my first Surprise Package for my son and I. We are so pleased with what we got last year. Once I mentioned Christmas shopping this year, my son replies, “Can we order each other Christmas Surprise Packages again?!?! D.H. in Central City, Nebraska, writes: Favorites: We love every one we’ve tried. 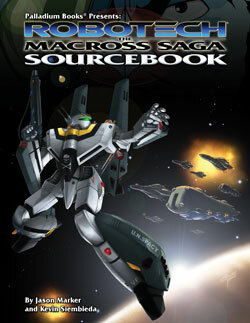 S.G. in Spring, Texas, writes (in part): I played the Robotech RPG 20 years ago and I am excited to support your Robotech® RPG Tactics project. Congratulations on the success of the Kickstarter and what appears to be the reinvigoration of the company. Have a Merry Christmas! E.V. in Scotland, Ontario, Canada, writes: Keep up the good work. I look forward to the Christmas Surprise every year. R.M. in Waupaca, Wisconsin, writes: HO HO HO! Merry early Christmas! I love these Surprise Packages. Best deal in the industry. S.R. in Burbank, California, writes: Thanks for another year of great products and good luck in 2014! 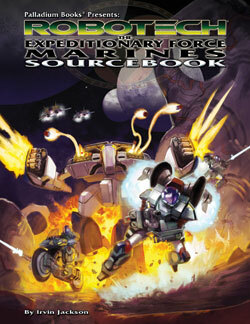 Can’t wait for my Robotech® UEEF Marines Sourcebook and lots more Rifts®. K.S. in New Holland, Pennsylvania, writes (in part): Want to say thanks. You guys rekindled my imagination with Rifts®. I love the lore that you and all the other writers put out. It helps me come up with stories for my RPG games, both Palladium and others. 48 pages – $12.95 retail – Cat. No. 234. November release! At the printer. 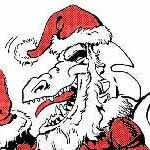 Palladium Fantasy RPG® – New creatures: Ice Bearmen and the Winter Serpent by Matthew Clements, Chuck Walton and Kevin Siembieda. “Official” Fantasy source material. 96 pages – $11.95 retail – Cat. No. 164. November/December release.